At the top of a hill in northern Italy, not far from Venice, stands a majestic villa. Designed by Andrea Palladio, the Villa Almerico-Capra, commonly known as La Rotonda, would become one of the most recognizable buildings of the Renaissance. It is a building that consciously recalls ancient Roman classical models but its innovative design had a lasting impact for future generations of architects in Italy and abroad. As an architect, Palladio was acutely interested in engaging viewers, something he often accomplished by making use of striking façades. What makes La Rotonda extremely unique is that it displays not one, but four of them. 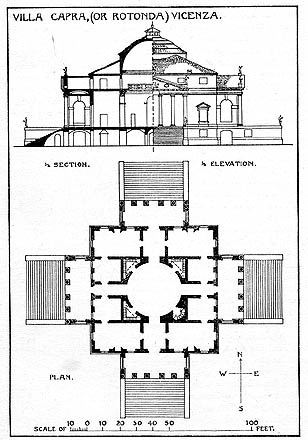 Idiosyncratic choices do not always result in groundbreaking creations; a building with four façades could have easily ended up being bizarre, but Palladio was able to design a serene, sophisticated construction by emphasizing balance, visual clarity, and uniformity. The design of the building is completely symmetrical; it presents a square plan with identical porticoes projecting from each of the façades. At the center of the building, a dome emerges over a central, circular hall. Palladio was concerned with harmony and mathematical consonance and used the square and the circle as essential, yet elegant forms. The picturesque qualities of the villa in relation to its environment are not coincidental. Palladio himself reflected on the landscape surrounding La Rotonda: “The loveliest hills are arranged around it, which afford a view into an immense theater.” In this way, La Rotonda presents four unique views: each of the porticoes is itself a place from which to contemplate the ever-changing spectacle of nature. At the same time, the villa also becomes a stage that can be contemplated from its surroundings. Because of its unique design, a façade is almost always visible: the viewer who walks around the villa never encounters a non-favorable angle. 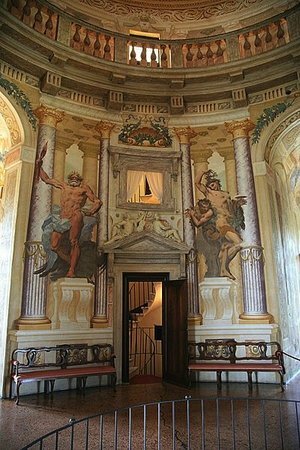 La Rotonda is perhaps the best known of the many country houses built in the Veneto in the sixteenth century. The popularity of villas at the time has to do with the changing Venetian economy. The Spanish and Portuguese voyages to America and Asia, along with Turkish military advances in the eastern Mediterranean, signified the demise of the Italian trade routes—which had been the primary source of wealth for the city-state of Venice. As a result, Venetians looked to the Terra Firma (their territories on the Italian mainland) to support their economy. It is at this time that agriculture became, for the first time, a significant economic source for the Venetian Republic. 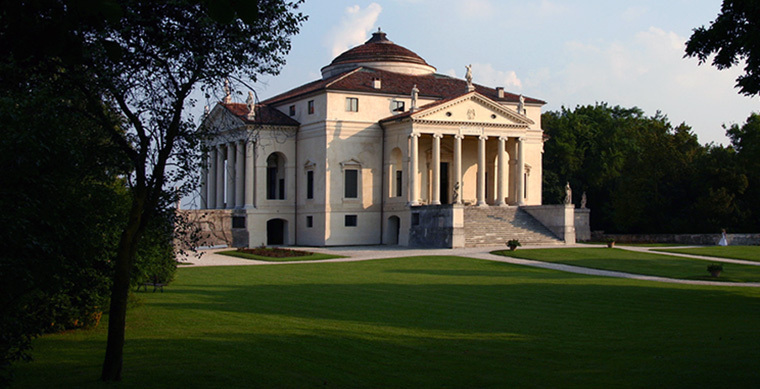 And yet, unlike other villas in the Veneto, Palladio designed La Rotonda without adjacent farm fields, or service buildings such as barns or warehouses. La Rotonda was commissioned by Paolo Almerico, a retired prelate who returned to Vicenza after a career in the Vatican Court. Almerico sold his house in the city to retire in the countryside. For this reason, La Rotonda was not technically designed as a villa as much as an urban residence placed in the countryside. Almerico never thought of this space as an agricultural production facility, and Palladio himself classified the building as a Palazzo. The ecclesiastical career of Almerico had a definite impact on the building. The religious connotations of La Rotonda are palpable in the vibrant interior, which contrasts with the sober exterior. Inside, La Rotonda is a colorful and vivid space that looks more like a church than a household. In fact, many of the paintings make explicit connections to the religious life of Almerico, celebrating religious values and Christian virtues, such as temperance and chastity. The exterior of La Rotonda also suggests the sacred. The edifice was influenced by ancient Roman temples (such as the Pantheon) and sacred complexes (such as the Sanctuary of Fortuna Primigenia). 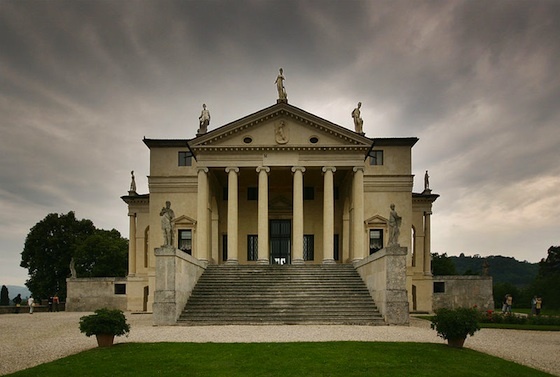 By using ancient Roman temples as a model, Palladio incorporates religious overtones into an otherwise secular space. At the same time, La Rontonda has a perennial quality to it; Palladio’s use of classical elements emphasizes a universal architectural language. Cite this page as: Dr. Javier Berzal de Dios, "Palladio, La Rotonda," in Smarthistory, August 9, 2015, accessed April 20, 2019, https://smarthistory.org/palladio-la-rotonda/.